When we released the Oliver + S Hide-and-Seek Dress last season we heard from many of you who wanted to sew it for yourselves. Which is good, because I had wanted to make an adult version of that pattern! So here we are: the Liesl + Co. Cinema Dress, available in women’s sizes 0-20. I love everything about this style. It’s relaxed, comfortable, and easy to wear, but it’s also feminine and flattering. The pattern includes all the features of the Hide-and-Seek Dress: front pockets with those cute welts, princess seams, a yoke that can be made from a contrasting fabric if desired, and three-quarter-length cuffed sleeves. 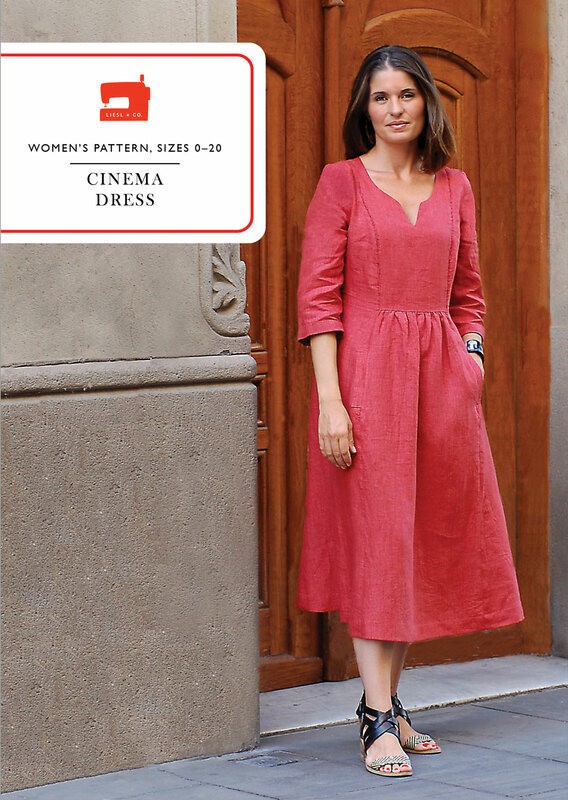 The new Cinema Dress pattern includes two dress lengths: View A hits just below the knee and View B is a longer, mid-calf length that’s so popular in fashion right now. Lengthen or shorten as needed. I’ve been adding about two inches to View B for myself (because I’m tall), and you could also shorten View A and wear it as a shorter mini-dress or even as a tunic for yet another great look. One of the things I like about this dress is that it can be made in a wide variety of fabrics for different looks. If you’re partial to printed cottons, I’m especially fond of sateen for this style. But I used our printed Lisette twill for the version above and it worked great! 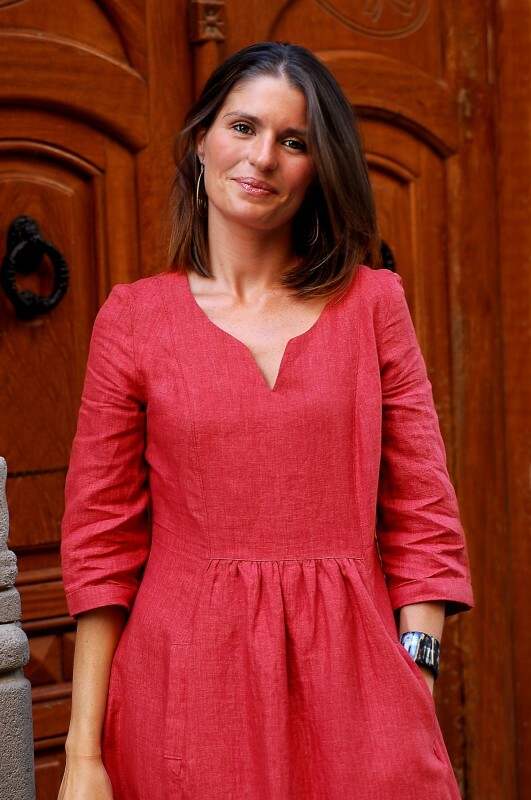 I wore it all summer in linen and loved it, but for fall I’m planning to make another dress in washed silk, which I think will be really beautiful and flowy and very contemporary looking. I’m sort of obsessed with the idea of an indigo ikat, too. That may need to happen soon. Also, fine wale corduroy or a lightweight wool would be fantastic for winter. This style has always reminded me of Frida Kahlo. Can you just see it with an embroidered yoke? 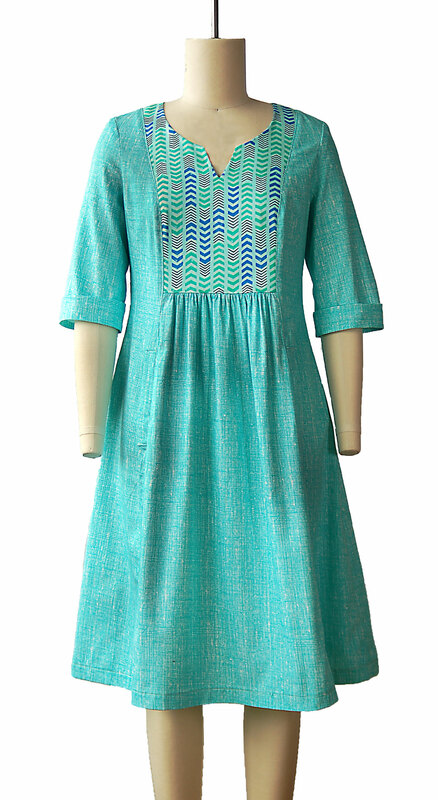 As you already know from the Hide-and-Seek Dress, this pattern is perfect for an embellished or contrast yoke. It has a little bit of that huipil feeling, don’t you agree? I also really like that it’s a seasonless style. I’ll absolutely be wearing this all fall and winter! As with many of our women’s styles, I’ve included instructions for a full-bust adjustment to help you with fitting this style. And the princess seams will help a lot, too. It’s so easy to take in a little here and let out a little there when you have princess seams to help you. I know you like ideas for styling your sewing, so I’ve been assembling lots ideas on my on Pinterest for you. I’ll continue adding ideas there, and I’ll add be styling ideas for our other upcoming patterns as well. 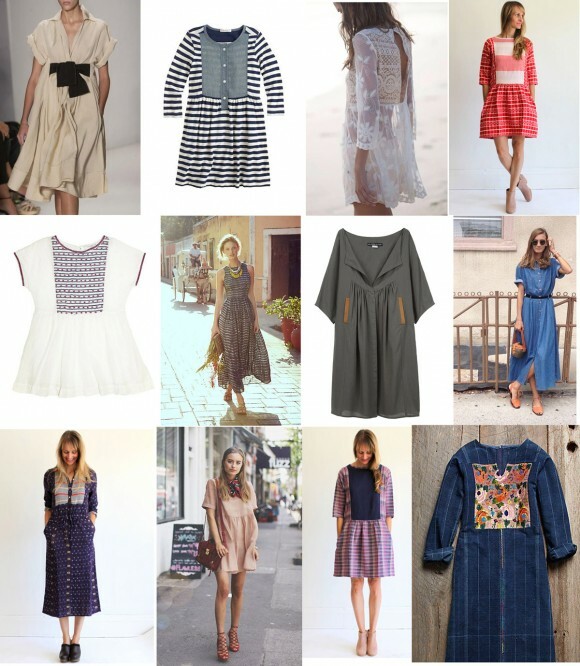 You can see many more ideas, and sources for all these photos, on my Liesl + Co. pattern styling ideas Pinterest board. 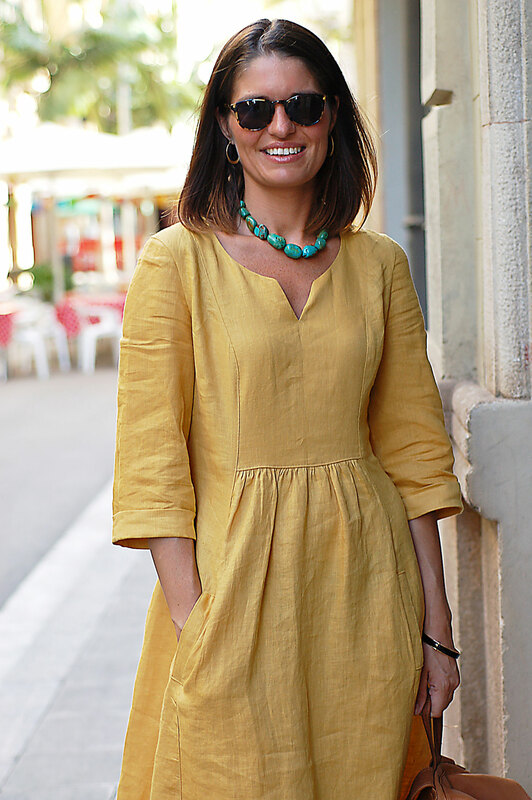 Personally, I wore this dress with sandals of all sorts this summer: really flat sandals for a casual look and sandals with heels for a more dressy approach. This fall and winter I’ll be wearing it with my short boots and maybe with taller boots when the weather turns really cold. 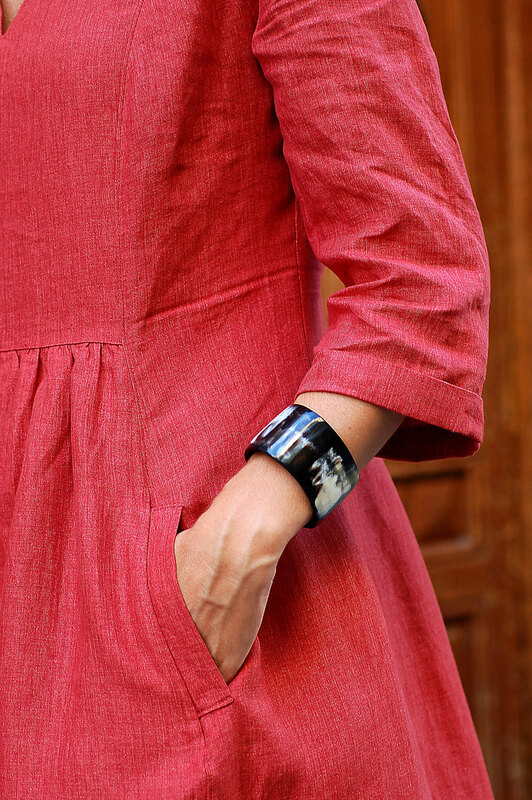 You don’t need a lot of accessories with this dress–it holds its own really well–but I like to wear a bold cuff bracelet or a longer necklace. It will be great with a long drapey cardigan when the weather calls for one. Or a scarf. Big fan of the scarf, here. How are you planning to sew this dress? I seriously can’t wait to see! I absolutely love it! I can’t wait to get my hands on the pattern. So many ideas buzzing around my head. That’s lovely! It looks so wearable and lends itself to decoration, as you say. The yellow version is very Frieda and I love her style. Thank you. I’ll be buying this one! Hmm, now should I buy it immediately or wait and see the others first as I live in UK. Wonder which works best for postage costs? Anyone? Linda, it’s a digital pattern only. No postage costs! But there is the initial download cost of $14.95. This is awesome. Congratulations on a job well done. I will definitely sew this for myself, I love it. Yes!! This is the one I have been waiting for. My winter wardrobe is now sorted. I have to have this pattern! It’s terrific! A dress I love more then the Portfolio. Oh Liesl, it is gorgeous. I love this one! I can totally see myself wearing it. And that say’s a lot, considering I’ve only worn a dress once in over 20 years! Michelle, absolutely! Just shorten the yoke by a few inches and add that same length to the top edge of the center front skirt panel. You might want to add a few inches to the center of that panel, too, to accommodate a growing belly. And congratulations! Thank you so much for the extended size. This will be perfect for me and my shape. I will be making a bunch of these for my trip to South Korea in May. I sure hope all the new patterns will have these sizes. I just had an idea of a shortened one with pants for a travel outfit, maybe in a chambray. Beautiful! I just finished with the Cappucino dress and loved the fit. This new one is a must have! Thanks for such a lovely design! This dress is absolutely stunning! I can’t wait to make one. I’m wondering, will you be posting Mood boards with fabric suggestions like you did last fall with the release of the patterns? My comfort level has been to sew with quilting cotton (and mostly for my daughter) but last year I bought a crepe that you had suggested on the Mood board post and I sewed up an Everyday Skirt which came out so beautifully (it has a gorgeous drape). I’d love to learn more about other fabric choices. Omg I love love love it! I knew I’d probably end up getting all the upcoming patterns after your post about your inspirations but didn’t think I’d fall so hard for the first one:). It’s even my favourite mid calf length. I never wear anything much shorter than that for the simple reason that I hate sitting on furniture and feeling it against my skin, unless it’s my bed! Even knee length means I’m constantly pulling my skirt down underneath me…… I see it in linen for now – our summer is still going strong iin Malta – and I have some lovely fine wale liberty cord for later. Yum. I do have a question – even though I measure 38 bust, I usually use 36 in the big four as its my high bust – and the back is usually a bit big. Should I go by my high bust for this pattern or full? Beautiful Liesl! Thanks for this one! Hi Francesca, your measurements sound very close to mine, and I wound up liking a size 8 (with an FBA, for my shape). Have a peek at flickr where I have posted a photo of my muslin with notes on changes I made, as well as two finished versions in different fabrics. It’s beautiful! I love this pattern. Have a question though – how would you do an FBA for it? Tali, detailed instructions for doing the FBA are included in the pattern’s instructions. Sarah, it’s a full-bust adjustment. Thanks Sarvi! I will muslin the 8 first :). I went into the liesl flickr group but didn’t find any pics of this dress though…..
I’m thinking of making this in chambray with Liberty contrast. Do you have any idea what kind of yardage is needed for the contrast yoke? I’m just wondering if I have enough Liberty to pull it off. 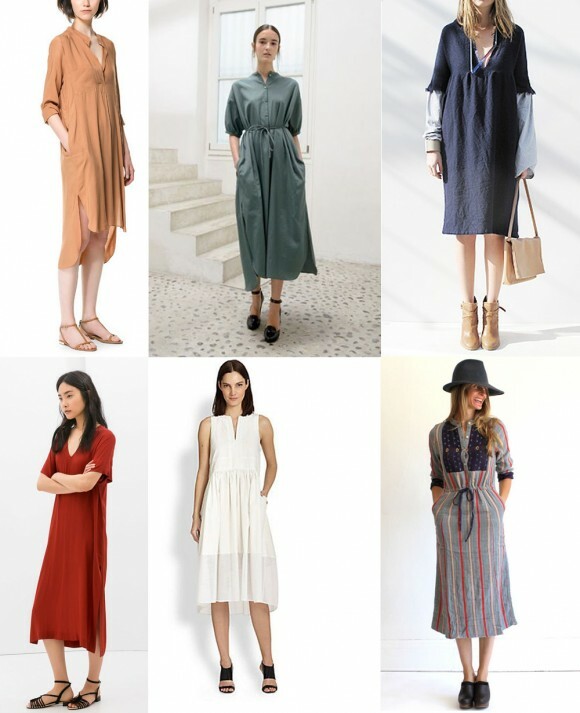 I live where the only fabric store is Hancocks and I appreciate their being here, but where can I order linen of the quality found in the golden linen dress? I love it!! It would make a beautiful maternity dress I think. Hey Leisel Thanks so much for this pattern !!! It is gorgeous ! Do you think you can post a picture of yourself in washed silk ? Thanks so much – can not wait until next Thursday !!! I love this – and would also appreciate advice on how much yardage the contrasting yoke takes. I see a lot of these in my future! Hmm, with a relaxed fit and the smallest size a 32 1/2 in the bust, I think I would be drowning in this dress. No SBA in addition to the FBA? Thanks Todd- as you told me its digital I’m buying it now! I agree, Freddie- that golden linen dress is my favourite! Which manufacturer is it, Liesl? Really really beautiful Liesl. I tried on 10 off the rack dresses for Australian spring summer and felt like crying, none were right for me and I resolved to sew something that fitted and suited me. But what? Right on cue, enter Cinema…classic, flattering, timeless really, I just can’t wait to make it. Is it just me but this season’s styles all seem too young (tight, bright, loud) or too old for my 41 years. This is just right though. I has also picked out her matching number in size 4. Thank you!! Well, it’s official…this is going in my sewing cue! It’s really beautiful and classic! Thanks for all your enthusiasm, everyone! To answer a few of your questions, I will be giving fabric suggestions for all our new patterns. The yellow linen is from Gray Lines Linen here in New York. And it’s difficult to give fit recommendations based purely on measurements since your overall frame will also come into play here (ribcage, etc.). In general, our sizing is very similar to off-the-rack sizing (J. Crew, Banana Republic, etc.) , and I always recommend making a muslin so you can check the fit since some people prefer a closer fit than others. This dress is intended to have a little ease, so don’t make it too tight! I hope that helps. Marcy, the bust adjustment instructions include small bust adjustment instructions. Our size 0 is close to an off-the-rack size 0, so it all depends on what size you usually wear. And one last comment: to make just the outer yoke from a different piece of fabric you’ll need about 3/4 yard. I love that the sides have waist shaping. Last time I was in the city I was tempted to pick up another Japanese sewing book for my patterns and darling daughter put it back down declaring “No more baggy clothes, Mom!” . She is all of 25 and has remarkable style all her own such that she gets stopped in NYC with compliments but I am 62, an upstate farmwife, and prefer to dress myself, thank you very much. That being said, I did not buy the pattern book. This pattern should pass with her approval. Whatever, I am buying and making it, another great excuse for fabric shopping in the city. I will probably change it up just a bit to put the buttons in the front for ease in dressing. My arthritis can make reaching back difficult. (an easy alteration). Dear Liesl, and Todd, thank you both so much. I’ve always loved the bright colours, and flowing fabrics that Frieda wore so well (a dear young friend has named her baby, Iris Frieda). And I’m charmed that the lady’s bravery and determination to surmount her difficulties has inspired your work. As always, your patterns are worth waiting for; and I’m still discovering the delights of some of the children’s patterns published some years ago. Thank you both. Any chance this will be a printed pattern at some point??? I second the query about a paper pattern – I’ve seen some lovely patterns (Cinema, and the others on the website) but I’ve never bought a digital pattern before and am apprehensive about doing so…I’d much prefer paper patterns that are already sized correctly etc- is that at all likely? For those of you wondering about a printed version, at this time we don’t foresee printing these. We wish we could, but our analysis shows that there is not enough demand for women’s apparel patterns in the independent wholesale channel to support doing even a small print run. We’re hoping that this will change in the future. If it does, we will move to printing them too, but for the foreseeable future, they will be available in digital format only. For those of you who have not purchased a digital pattern, let me assure you that they are very simple to use. And if you want a full sized pattern sheet, you can take the last page of the file to a copy shop that has a 36″ wide printer and have it printed there. Echoing Todd, these patterns are an exceptional PDF. In fact, if this is the first PDF you have purchased you will be very disappointed with other companies. They print well at home, glue together easily with a glue stick and you can fold and press the paper pieces. The dark outline makes them very easy to draft. I store mine in a large ziplock bag, perfect. Picking out lovely summery fabrics from the stash for this one. I will be adding to the gathered front skirt to accommodate the bump. This would be perfect for maternity as well as post bump. Now I can’t wait to see what the next pattern will be. What an extravaganza of sewing pleasure we have before us! This would be fab for all tear round as you say. Another winner Liesl! I love it! Hi from sunny France Lisle, my first purchase from you but I allready LOVE the way you do the pdfs, not a problem at all to put together especailly as you have many of the pieces not overlapping sheets. thankyou, no more printsew for me! I bought the pattern before my holiday, was counting the days to get home sewing! Brenda above commented on sewing with the buttons at the front, I have similar isues with shoulders/hands and had thought to put in a zip instead, I actually came here today looking for fabric inspiration. How could the front yoke be adjusted? I think I would like that better, I have some nice buttons in my stash….. I made the dress for myself in a midsize contemporary floral lawn in soft coral, cream,gold, and sage. I just love this dress! It is so comfortable – I’ve worn it all summer long! Address hangs from your shoulders and you can move very freely but it is elegant. It’s the kind of dress that you can wear casually or to work – it’s completely versatile. The neckline is so lovely. I get so many compliments on it. It’s a lovely flattering cut for many body types and a well drafted pattern. Couldn’t you please distribute this dress via Butterick, as with your Lisette subdivision garments, so that I can buy a paper version in the UK? (I really don’t want to faff with a digital version). I’ve been hanging my nose over it since I first saw it over a year ago. I’m sure it would be a very popular item. Joy, our Lisette for Butterick patterns are produced and distributed by Butterick patterns, while the Liesl + Co patterns are produced, distributed, and sold by us an an independent company. You can buy the patterns directly from our website or you can also request them from local fabric shops. We’d love it if your favorite shop wants to carry the patterns! Thanks very much for the reply and info – at least I’ve found the paper pattern section! I’m considering an order, but £19.50 ( inc. p&p) makes it a very expensive pattern for me. I will ask a couple of local stores. Any chance you’re ever going to offer this in plus sizes? Why stop at 20? Plenty of us larger ladies love this pattern too, you know.